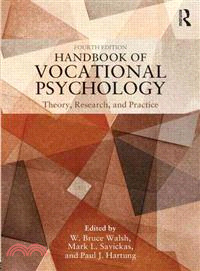 Handbook of Vocational Psychology identifies, reports, and evaluates significant developments in vocational psychology and career counseling, and in doing so provides both professional clinicians and students with an informed understanding of both the current state and continuing progress in the field. As in previous editions, the fourth edition links theory and research with the more applied aspects of this field: four sections cover, in order, the field's history, theory, research, and practical applications. Clinicians, students, and academics at all levels of experience will find that the Handbook of Vocational Psychology, 4th ed, paints an accurate picture of the realities of work and serves as a practical reference work for anyone interested in keeping up to date with the latest research and trends in vocational psychology. W. Bruce Walsh, PhD, is professor emeritus in the department of psychology at the Ohio State University. Walsh is the founder and charter editor of the Journal of Career Assessment. He has coauthored and coedited 24 books and 150 journal articles. In 1998 he served as president of the Society of Counseling Psychology and in 2010 president of the Society for Environmental, Population, and Conservation Psychology. From 1990 to 2002 he served as the director of training for the Counseling Psychology Program at Ohio State. In 2004 he received the Leona Tyler Award from the Society of Counseling Psychology of the American Psychological Association in recognition of outstanding accomplishments. Mark L. Savickas, PhD, is professor of family and community medicine at Northeast Ohio Medical University. His 80 articles, 40 book chapters, and 500 presentations to professional groups have dealt with vocational behavior and career counseling. From 2011 to 2014 he served as president of the counseling psychology division in the International Association of Applied Psychology and has been and editor of the Journal of Vocational Behavior since 1999. He received the Leona Tyler Award for Distinguished Contributions to Counseling Psychology (2011) from the Society of Counseling Psychology of the American Psychological Association and the Eminent Career Award from the National Career Development Association. Paul J. Hartung, PhD, is professor of family and community medicine at Northeast Ohio Medical University and adjunct professor of counseling at the University of Akron. A fellow of the American Psychological Association (Division 17) and the National Career Development Association, he has authored over 70 journal articles and book chapters dealing with career development, assessment, and counseling. He is the incoming editor of The Career Development Quarterly.